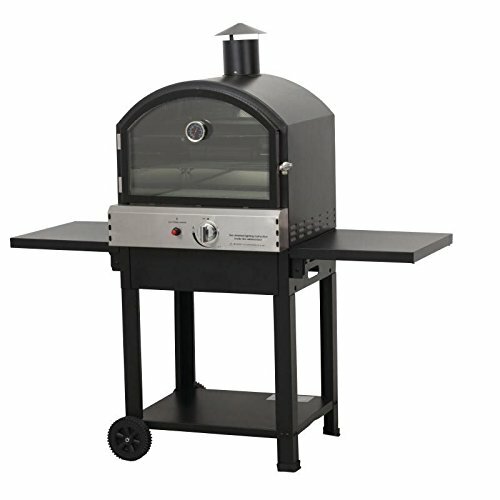 Create homemade style pizzas and amaze your guests with the help of the Lifestyle Taranto Pizza Barbecue Oven, a compact and manoeuvrable outdoor appliance that suits any style of home or business. Choose between a standard and slow cooking area to prepare a variety of barbecue style food including chicken, burgers and kebabs. For the signature Italian dish, a pizza stone comes included with the product to provide perfectly crisp and evenly cooked pizza bases to complete the authentic charm. Fold down side shelves allow plenty of space for food to cool and makes the oven portable and easy to tidy away. A front viewing window and assisting temperature gauge gives you complete control and observation across every stage of cooking, keeping your customer's mouths watering and stomachs grumbling.